This vegan caramel sauce is silky, creamy, gooey, sweet, and so easy to make. You can drizzle it over oatmeal or pancakes, dip some apples into it, pour it over vanilla ice cream, spread it on cakes, eat it straight out of the bowl with a spoon . . . the list could go on and on forever. The best part is that you can make it as thin or as thick as you like. When I was growing up, I used to love when my parents took me to a city center. Right on the main street, there was a tiny little shop that sold soft serve ice cream. They would rotate their soft serve flavors every couple weeks so it was a little surprise every time we went. It was sweet. It was cold. It always hit the spot. While I enjoyed all the flavor choices, my all time favorite was plain vanilla soft serve dipped in warm, sweet, and sticky caramel. I know, not healthy, but I didn’t worry about that then. There was just something about the vanilla and caramel flavor combination and the diverse textural components that made this dessert simply irresistible. 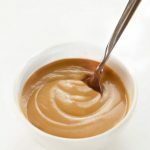 While I’m not gonna share with you a recipe for vanilla soft serve today, I will show you how to make raw vegan caramel sauce (which you can easily turn into a caramel dip) that is super delicious! First things first, this recipe is raw. If you want a more traditional vegan caramel, you can simmer some coconut milk with coconut sugar over low heat until the mixture turns into a caramel. But since we’re making raw vegan caramel today, there will be no heat involved. So where does the caramel flavor come from if not the caramelization of sugar? Medjool dates. No, this is not a recipe for date caramel. However, adding a few dates is essential for the rich and intense caramel flavor. The reason I’m not a fan of the 2-ingredient date caramel (which only consists of dates and a splash of plant-based milk) is that the texture isn’t right. Date caramel is great as a filling or a spread. But it’s too thick, sticky, and somewhat pasty to serve as a caramel substitute. What makes this caramel sauce stand out is the addition of cashew butter. Cashew butter is a rather neutral-tasting nut butter that’s great for creating rich flavor and silky smooth texture. I bet rich macadamia butter would be great too, but it’s also very expensive so I always go for cashew butter. I also add a generous pinch of sea salt (because I’m still riding the salted caramel trend), and some maple syrup. It might seem weird to add a sweetener to already sweet dates, but the viscosity of a liquid sweetener is essential for a smooth pour-able texture. An alternative to maple syrup is coconut nectar, which creates a more chewy (less pourable) caramel. If you’re going for a caramel sauce, I would suggest using maple syrup. If you prefer caramel dip, coconut nectar will work better. Finally, if you need your caramel to be super thick, you can add a little bit of melted coconut oil. As the coconut oil hardens, so will the caramel sauce. Coconut oil also adds shine and a richer flavor. I don’t always use it in this caramel sauce (because I try to use whole ingredients as much as possible), but you can experiment with it. If you’ve ever made traditional caramel sauce you probably remember watching it carefully. You had to keep one eye on the sauce (to prevent burning) and one eye on a candy thermometer (to ensure the appropriate temperature). Well, you don’t have to worry about any of that with this raw caramel. All you need to do is blend all the ingredients (except the dates) until creamy and smooth. The final thickness and sweetness of the caramel will depend on how many dates you use. The more dates, the thicker (less pourable) and sweeter the caramel will be. 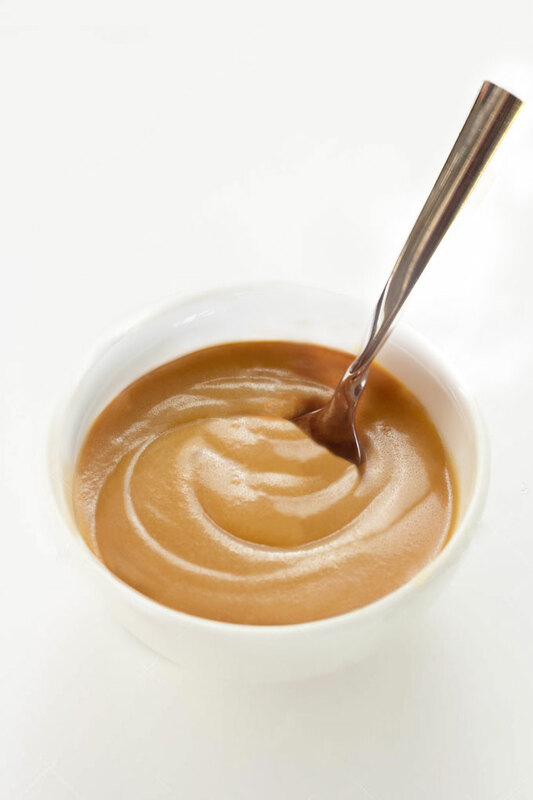 This vegan caramel sauce is silky, creamy, gooey, sweet, and so easy to make. You can drizzle it over oatmeal or pancakes, dip some apples into it, pour it over ice cream, spread it on cakes, eat it straight out of the bowl with a spoon . . . the list could go on and on forever. The best part is that you can make it as thin or as thick as you like. Place all the ingredients (except the dates) into the blender and blend on high until fully incorporated. 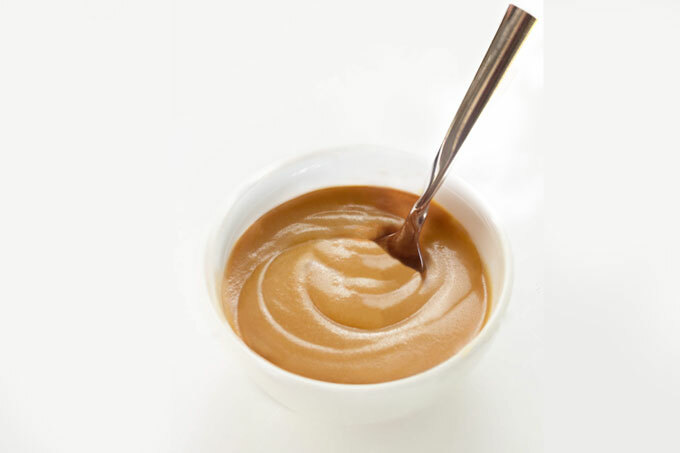 While the blender is running, add one date at a time to the blender until the caramel sauce reaches a desired consistency (add a little bit more liquid if you prefer it to be runnier or a few more dates or nut butter if you prefer it to be thicker). 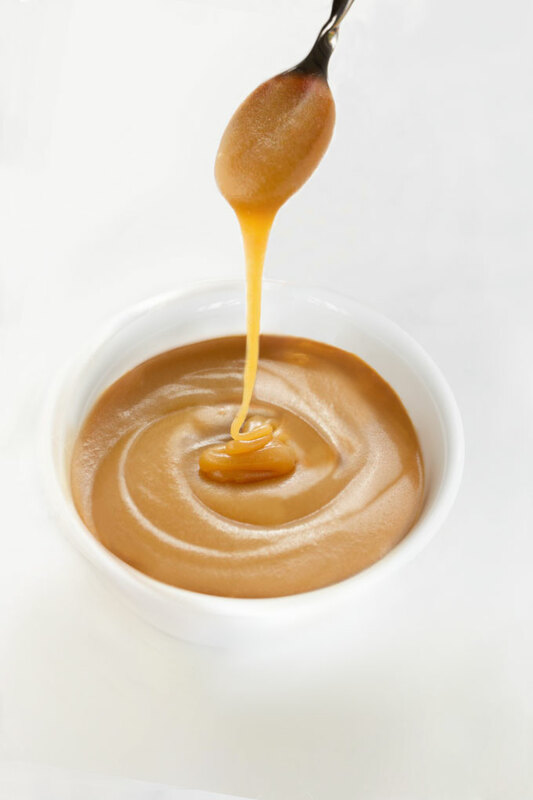 Store leftover caramel sauce in an airtight container in the refrigerator for 1-2 weeks. (The shelf-life will be shorter if using homemade almond milk. The caramel sauce will last for however long your homemade milk lasts). *The number of dates you use depends on the thickness and sweetness of caramel you want. The more dates, the more almond milk you might need to add. I made this caramel sauce today and it was amazing! Thank you so much for sharing this recipe!! This looks amazing! I’m going to try this tomorrow- so excited! One time I was creating in the kitchen & made a Carmel dip but didn’t know how I did it. This recipe is so great to have. Wow wow wow…….made this last night and it is the best caramel sauce ive ever had. I love it when you try a recipe and it turns out better than you thought it would. It tastes amazing and even better knowing its all natural ingredients. My dairy/refined sugar eating husband tried some and he loved it, he said if he didnt know what it was he would have thought he was eating cake batter!